April 25 is National Telephone Day and there’s no better time to consider the critical role the telephone has played in business, public safety, and personal connectivity. While the story behind the invention of the telephone has been disputed for over a century, one thing is clear: telephone technology has come a long way since the first phone call was placed in 1876. Today, more than half of Americans live in cellphone-only households. Many businesses are going the same way, eliminating landlines and replacing them with cloud-based phone systems. This shift can save money and provide geographic flexibility for remote employees and on-the-go salespeople. But unreliable cellular signal can quickly negate these benefits. Unreliable service is more common than you might think. Buildings, geographic features, trees, and even certain types of weather can block cellular signal by preventing a cell tower’s radiofrequency (RF) waves from reaching devices. In a Pew Research Center survey, 72% of cell phone owners claimed they experienced dropped calls at least occasionally. If you are a business owner, you know that this stat doesn’t bode well for your team members who depend on reliable cellular connectivity for managing customer service, connecting with vendors and coordinating with employees. Not only is losing a call or having spotty service frustrating, but poor cellular connectivity can negatively impact the delivery of goods, customer service and reputation. If your business is experiencing cellular call problems, National Telephone Day is a great time to evaluate your connectivity and potential solutions. Let’s answer a few questions to get you started. What’s causing your poor cellular connectivity? Distance. If a phone is too far from a cell tower, the signal will be weak or even undetectable. This is common for businesses located in remote areas far from a cell tower. Obstruction. When an obstacle, natural or man-made, comes between a phone and the nearest cell phone tower, it affects the strength of service. Common obstructions include hills, mountains, buildings and trees. Can you test for poor signal? Step outside to see if signal strength increases. An increase could indicate that building materials weaken the signal. Both Android and Apple iOS phones provide “Field Test Mode” options to test for signal strength and will present signal strength in decibels (dB) rather than bars (The closer the number is to 0, the stronger the signal). For example, -90db is a stronger signal than -105dB. Conduct a site survey with a signal meter. A signal meter detects and displays signal frequency, bandwidth, and strength with total certainty, and also updates in real time. What are your options for improving cellular signal strength? Size of your building. Larger buildings require additional hardware to both cover the area of the building and account for interior obstructions. Number of users. Businesses with a large staff or aggressive growth plans need more dynamic solutions with the capacity to handle multiple devices without compromising quality. Budget. Connectivity options exist to fit every business’s budget, from free-to-use applications to multi-million-dollar solutions. Ease of installation. Some connectivity solutions can transform signal strength or serve as a workaround in a matter of minutes, while others require more intensive installation requirements, taking upwards of a year. For most businesses, these factors narrow the list down to Wi-Fi calling, network extenders, digital applications like Skype, and active or passive distributed antenna systems (DAS). Passive DAS, also known as a cell signal booster system, provides a cost- and time-effective solution for nearly all businesses. In these systems, antennas on the outside of a building capture the cellular signal and pass it through a booster where the signal is amplified and redistributed inside the building, but is otherwise unaltered. One of the biggest selling points about these solutions is that they’re carrier agnostic. No matter which cell phone network you’re on, you can count on improved performance. Plus, installation of a passive DAS costs anywhere from 30 cents to 70 cents per square foot and can take as little as a few days. 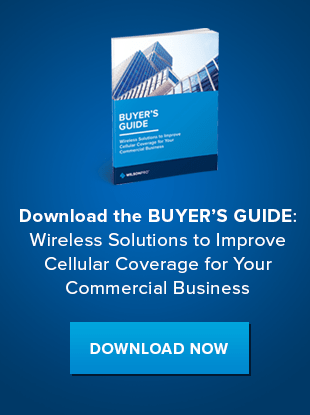 Download our Buyer’s Guide to learn more about cellular connectivity options available for your business.